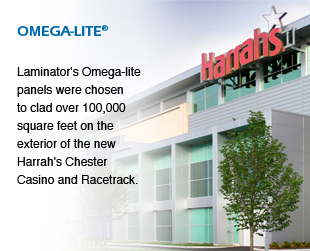 Omega-Lite® aluminum composite panels provide durable, eye-catching fascias, soffits, canopies, and decorative towers for retail, schools, hospitals and high profile commercial projects. With over 40 standard colors and 2 different surface finishes to choose from, you get the look you want and the colors you need Installed in a fraction of the time. Omega-Ply panels provide a decorative accent for fascias, soffits, and storefronts. A high impact-resistant plywood or hardboard core provides exceptional strength and rigidity. These panels are easy to handle and install at a very low cost using extruded moldings. Panels are available in smooth or stucco-embossed finishes in your choice of over 40. Unlike plastic cores, the wood cores of Omega-Ply panels may absorb water; consequently, special attention to caulking is essential for a long-lasting, high quality appearance. When you need a high-tech look with energy-saving insulating properties for glazing inserts, Thermolite™ foam core aluminum panels are the answer. They are available in smooth or stucco-embossed finishes in over 40 durable colors... at an affordable cost. Thermolite panels are easy to handle and install and provide water-insensitive, virtually maintenance-free service for up to 20 years. Omega Foam-Ply panels are suitable for exterior wall cladding systems for most building types. Omega Foam-Ply panels feature an insulating polystyrene core and have an overall panel thickness of 5/8" to 3½" (16 to 89mm), 1" thick (25mm) is typical. Omega Foam-Ply fits standard insulating glass curtain wall and storefront extrusions.